Safe and effective reagents to treat wastewater from a major envelope manufacturer. An adapted flocculant/coagulant treatment that purifies rinsing waters loaded with glues and inks, to reveal clean, clear water! A well-known envelope manufacturer has two gluing machines that require washes and rinsing with fresh water one to several times a day. This process generates 2000 to 3000L of washwater per day. 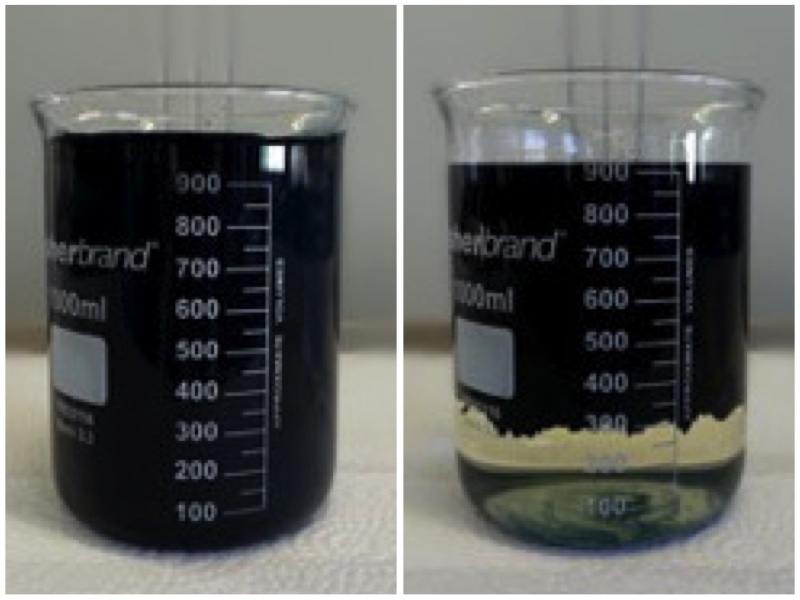 This wastewater contains mainly glues and ink. Before the treatment, the wastewater was black and highly polluted, with high levels of iron (2.81 mg / l) and lead (0.16 mg / l). The customer is concerned about his environmental impact and would like to reduce these contaminants to a minimum. He contacted our specialists in physicochemical treatment of wastewater. Flocculation treatment to clean heavily polluted wastewater. The latest-generation NISKAE products propose safe and efficient cleaning agents. A sample analysis of dirty water in our laboratory allowed us to develop a formulation that is adapted to the parameters found. Our flocculation treatment resulted in a perfectly clear water and virtually zero contaminant levels. In particular, the iron and lead values now stand at 0.25 mg/l and 0.01 mg/l, respectively. In addition to superior performance, NISKAE reagents are efficient in small doses, reducing maintenance costs and making operations easier. The company plans to acquire a reliable and efficient water treatment system for simplified and responsible wastewater management. To be continued ! In more than 15 countries through a network of exclusive distributors in Europe, Africa, Asia and America.